This picture is from the article that is causing such a controversy in Shrinkette (Feb 10) and other blogs. Unfortunately the online article does not give any information about the artist. 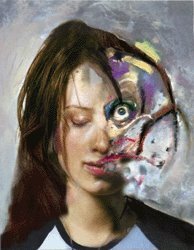 Schizophrenia frequently permanently transforms a person. You can usually get rid of the hallucinations and delusions with medications, but negative symptoms often persist and cognitive decline sometimes occurs. dip·lo·mat ( P ) Pronunciation Key (dpl-mt)n.
One, such as an ambassador, who has been appointed to represent a government in its relations with other governments. One who uses skill and tact in dealing with others. One of my pet peeves is when a physician mistakenly calls himself a "diplomat", as in diplomat of the American Board of Internal Medicine. It's "Diplomate." I see this mistake all the time on letterheads and cv's. "...when was the last time you let your doctors know how much you appreciate all they do for you...we have created some thank you cards that you can download..."
This makes me embarassed to be a member of the AMA, which I recently joined because it was required for a local insurance network. The AMA should not be asking patients to thank its members. A physician advocacy organization should not be going around begging patients to thank them. The answer: It depends. Certain financial situations are sufficiently complicated that you really need an accountant's expertise. And, in many cases, the hours spent doing your own taxes could be more profitably spent seeing patients. A doctor (post-residency) who would do his own taxes and not even have an accoutant look at the tax form before sending it in is, in my opinion, being very foolish.